Love is in the air in the crap part of Soho as Roger and Michael celebrate their union with a Valentine’s Day Special. Luckily, it’s a mix of business and pleasure. 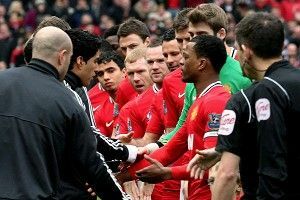 The blazered men cover last weekend’s Handshakegate between Liverpool’s Luis Suarez and Manchester United’s Patrice Evra, reconcile after Roger’s lionhearted Everton dispose of Michael’s woebegone Chelsea, and uncover some inspiring tabloid journalism involving Arsenal’s Aaron Ramsey. We advise romantic partners to relish these suboptimal sounds before the FA Cup makes its underwhelming return Saturday.